Andrew Mori of Amori Weddings, a Westlake and Malibu based wedding photographer, shown here photographing Tiffany and Marco's gorgeous wedding at Calamigos Ranch / Malibu Wines in Malibu, California. Amori Weddings is a Malibu Fine Art Wedding Photographer and Videographer. Hi! We're Amori Weddings- internationally published award-winning wedding photography and videography company based out of Ventura County, California. Last year we were so blessed last year to be featured on NBC and this year on ABC for our Disneyland Engagement photos. We boast a 14-day turnaround, customizable packages and beautiful images and albums! Our passion of story telling through the memories we capture has helped us build our reputation toward becoming the best wedding photography and videography company in Ventura County, from Westlake to Malibu, and to Santa Barbara. I absolutely love weddings. It's why I've chosen to specialize in shooting them. As a photographer, my job is to capture your story so looking back on the photos you can remember your special day. As a wedding photographer based in Southern California, I shoot about 20 weddings a year here in our beautiful state. I photograph an additional 10-15 each year outside of California, sometimes in the US but often throughout the world. I am always on the lookout for moments of emotion. I feel like they tell the best story of your day. For some, that might mean enjoying a laugh together, for others it might mean wiping a tear from your loved one's cheek. Planning for a wedding is a lot of work. Lots of decisions go into finding the right colors, picking the right flowers, choosing which jewelry to wear and of course many other elements of the day. As your photographer, I will do my very best to capture all of these details. If you would like to see a whole gallery dedicated to wedding details click onto my portfolio page where you'll find one gallery entirely dedicated to sharing these types of photos. It might even give you some great ideas for your own wedding. Capturing the beautiful painted skies of a sunset, while properly lighting a couple, requires a specialized skill set. This is something I love doing and even teach to many photographers on my team. It might be a nice crisp silhouette, or you both lit perfectly as a couple against the gorgeous sky—these photos typically end up being the ones you turn into a canvas for your home or two-page spread in your wedding album. One of the keys to getting great sunset photos is proper timeline planning. This is something I'll help you do so we have the best shot at getting the photo if Mother Nature decides to put on a show on your wedding night. RECEPTIONS ARE A LOT MORE THAN JUST A CAKE CUTTING. If you are looking for me during the reception look towards the dance floor. That is often where I will be documenting the fun, laughter, killer dance moves, and emotions of all your friends and family. You won't find me on the edges of the room checking my phone to see what time it is. Receptions are so much more than a first dance and cake cutting. Photographs might include the groom stepping outside with his friends to smoke a cigar. 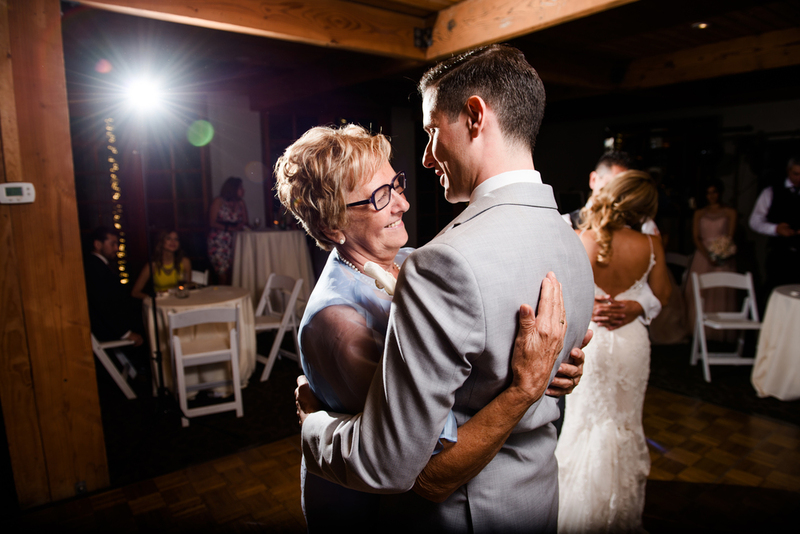 A grandma dancing with her grandson on his wedding day. Or maybe an awesome shot of your friends racing towards your bouquet to catch it. This will be the best party you'll throw your entire life. You deserve to have it photographed from start to finish. Some couples like to finish up the evening with one final romantic slow dance, others might enjoy running through a tunnel of sparklers. Whatever you decide, I'll capture it! Does it look like I would be a good fit as your wedding photographer? If so, I would love to hear from you. I'll check the calendar to make sure your date is open and then we'll set up a time to get together in person, video chat, phone or even text. Whichever you prefer. Looking forward to receiving your message! You can also find me on Facebook, Twitter, Pinterest, and Instagram.